Ozondjahe Hunting Safaris is located in a malaria-free zone in the central region of Namibia. Our territory neighbors the Waterberg Plateau National Park and the closest city is 25 miles (40 kilometers) south. The city of Otjiwarongo (population 25,000) has all of the basics such as banks, post office, pharmacies, souvenirs, doctors and hospitals. We are a two and a half hour drive north of the city of Windhoek. 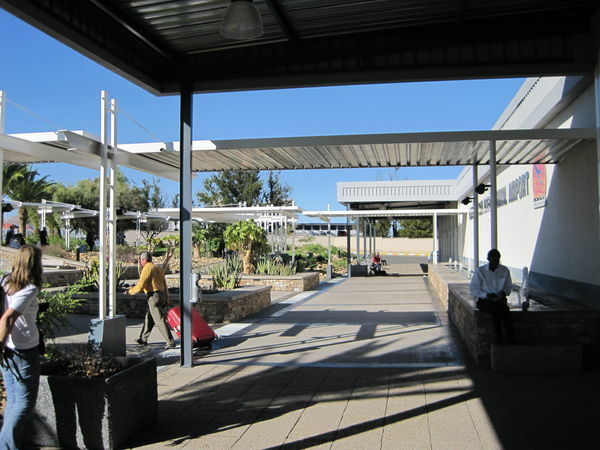 Windhoek International Airport is an additional half hour drive east outside of the city. 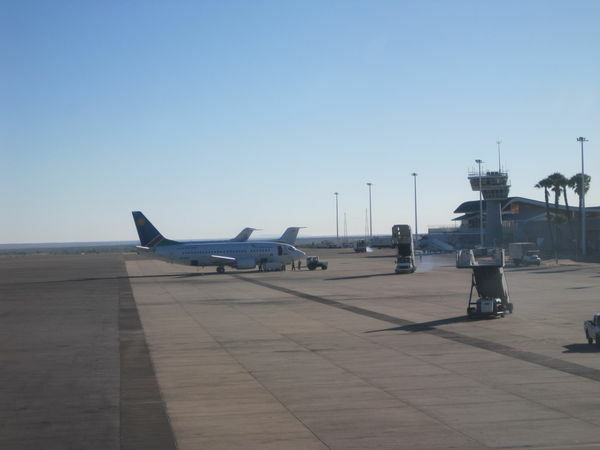 Your final destination will be Windhoek International Airport (Hosea Kutako International Airport – Airport Code WDH), just outside the Capital of Namibia, Windhoek. A majority of international hunting clients will fly from their country of origin into South Africa on a major international airline, many of which offer a route to Johannesburg (Tambo International Airport – JNB). A less traveled, although still popular route, is through any major European city to Johannesburg. 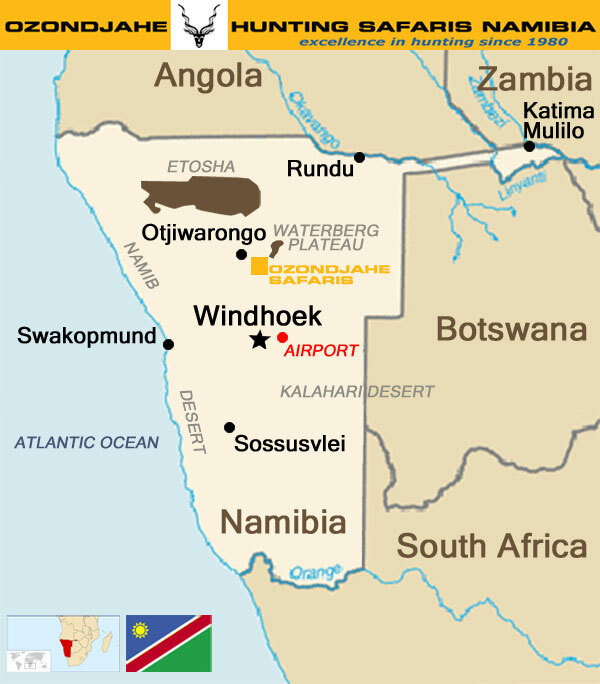 Both routes then require a short flight to get to Namibia’s capital Windhoek. Direct flights into Windhoek are available on Air Namibia through Frankfurt Germany several days a week. Most of our clients will fly via South Africa for the convenience of it as they have daily flights. Avoid traveling through London with firearms. American Airlines as well as other airlines will not even allow you to take your firearms to London. Airline tickets are a large expense related to your safari and for that reason it can be well worth your while to do some checking into prices and itineraries. In general, the internet is a great resource tool for comparing prices and booking a domestic flight, however that’s not really the case when it comes to looking for the best airfare to Africa, especially if you will be hunting somewhere other than South Africa. There are only a few websites that offer flights to most African countries, even fewer offering flights to some of Africa’s less traveled destinations and because there is little to no competition on these routes bargains are usually hard to come by on the internet. I always recommend that hunters use a travel agent who specializes in international destinations and who is familiar with Africa in particular. However the best way to go is to use a travel agent whose speciality is booking trips for international hunters to Africa. A travel agent with extensive experience sending hunters to Africa on a regular basis will be a valuable resource in every aspect of your trip. Most hunting travel agents get far better prices than you could ever find on your own. Not only will they be able to inform you of the best routes possible based on airline regulations and navigate you through the pitfalls of the airline industry when it comes to hunting travel. Their specialization comes with up to date knowledge of requirement for hunters traveling with firearms and ammunition, as well as assisting you with firearm permits and other paperwork. They should be able to verse you on the importation or transiting procedures through countries with weapons and ammunition. Another huge advantage of going with a hunting travel agent is if something goes wrong, you have someone, a real person, to help you straighten things out. Be sure to carry with you the contact information of your hunting travel agent while traveling so you can reach them if needed. An experienced hunting travel agent should have good tips for hunters who are traveling and be able to verse you on the most convenient and best places for hunters to stay and even eat while on layovers or before/after the hunt as well as small side excursions that are possible. I highly recommend Travel Express in Montana, a travel agency that specializes in sending hunters to Africa and around the world. Travel agent and owner of Travel Express, Lori Spears, a hunter herself can help you as she is very knowledgeable of the outdoor sporting industry having personally hunted throughout Southern and Central Africa, New Zealand, Argentina and North America. She can assist you with all aspects of your hunting travel planning. Lori has worked in the travel agency industry for over twelve years and owns Travel Express, an ARC accredited agency. Her focus is on arranging airfare for sportsmen with an emphasis on African destinations. She strives to offer a very personalized service with the client’s budget and needs in mind. Travel Express is a full service travel agency that can assist with all aspects of your hunting travel planning from airfare, lodging and car rentals to entry visa’s, firearm permits, trip insurance policies and medical evacuation services. You can rely on her experience and personal commitment when contemplating your next hunting adventure. I have been using Lori personally for many years as well as the majority of our clients and am confident to send those I know to her as she is always friendly, detail oriented and offers a great service and excellent prices. Travel Express Your Travel Agent Specializing in Hunting! – A pen is an essential to carry and have handy while traveling. – Airline ticket(s) and itinerary. – Valid passport with visa(s) if required. Copy of your passport and visa for trophy permit needs or in case you loose your passport. – A driver’s license or other acceptable piece of identification. – Phone numbers for family, friends or work that you don’t have memorized. – Ozondjahe Safaris will provide you a few weeks prior to your departure with a Contact Information Sheet which lists all of the information for us, including company names, contact persons, country, phone numbers, email addresses and cell phone numbers. Cell phones are now more common than land lines in Namibia. I suggest that you make a copy of this contact sheet for each piece of your luggage along with a copy of your flight itinerary in addition to carrying this list on your person while traveling. – You may also wish to give a copy to family members and/or a friend along with your itinerary so they can reach you if they need to. To make it easier for everyone, include the international dialing code (011 for the U.S.) and the country codes of the countries you will be visiting to the phone numbers on your list, Namibia country dialing code is 264. – Copies of prescriptions for medications that you are carrying. All foreigners must be in possession of a passport that will remain valid for at least six months after the intended date of departure from Namibia as well as a round trip airline ticket. While flying through South Africa, make sure you have at least two blank pages in your passport for visa stamps, more if you are adding stops to other countries in your itinerary. Citizens of the Austria, Belgium, Canada, France, Germany, Ireland, Italy, Japan, Lichtenstein, Luxembourg, Netherlands, Russia, Singapore, South Africa, Switzerland, United Kingdom and United States of America planning to spend no more than 90 days in Namibia will be issued a temporary entry visa at the airport upon arrival. For a complete list of countries please click here to the Namibian Embassy web site www.namibianembassyusa.org. As the list changes from time to time, it is important to verify if you need to obtain a visa based upon your country of citizenship. Persons possessing passports from other countries may be required to obtain an entry visa prior to departure from their country of origin. This should be done well in advance as it can take some time to complete the process which may require sending your passport to their Embassy or Consulate. To find out if you need to apply for a Visa in advance, a great resource with free information is Travel Document System (TDS) at www.traveldocs.com. In the unlikely event of an emergency, we have sophisticated medical services available in Otjiwarongo, 25 miles away from Ozondjahe’s lodge. No vaccinations or International Health Certificate are required to enter Namibia, although hunters should keep with Tetanus boosters and international travelers are generally advised to keep Hepatitis A vaccinations up to date. Malaria does not occur in our arid region, but is present in the northern-most part of Namibia. Should you decide to take malaria medication, consult your doctor well before your departure. We suggest that you visit the Center for Disease Control & Prevention (CDC) for their recommendations for travel in Namibia. Ozondjahe does not provide insurance of any kind and we advise our clients to purchase their own independent insurance policies. Contact your insurance company to find out, to what extent, if at all, your valuables such as firearm(s), binoculars and/or camera(s)… are covered in your home owner’s insurance policy in case of being stolen and/or lost while traveling. You may purchase an independent policy for this purpose or contact your current medical insurance company well before your trip to find out to what extent you are covered while overseas. Be sure to tell them that you will be engaging in a hunting safari as many insurance companies will not provide coverage if you are participating in a dangerous activity that they deem an extraordinary risk. For some insurance companies you may need to inform them in writing of your trip in order to be covered. You need to ask how to notify them if you require medical services, you may have a limited amount of time to inform them. If you pay for your airline ticket(s) with your credit card you might also be insured to some extent with your credit card company. I have heard too many stories from hunters who were happy to have had such membership (or wished they did) not to believe that it is an important aspect of any well planned hunting safari. Thankfully most hunts come off without a hitch; however unavoidable unforeseeable circumstances or unfortunate incidents are an inevitability if you travel enough and we would like to see you protected from financial loss or worse. For a fraction of the cost of a hunting safari, a medical evacuation membershipis a worthwhile investment. This is especially true if you cannot afford to lose what may have taken you years to save or you wish to protect your savings from being depleted by an unfortunate event. You should be aware that regular travel insurance does not cover many activities undertaken by a hunter or adventure traveler, therefore you will need specialty developed exclusively for hunter’s active lifestyles. Trying to decide on medical evacuation coverage can be complicated. For this reason, we have reviewed several medical evacuation companies and their products and have chosen to recommend Global Rescue. They are a well-known, respected and experienced company that offers high quality, comprehensive, affordable medical evacuation memberships designed specifically for traveling hunters, their observers and outdoor adventurers. 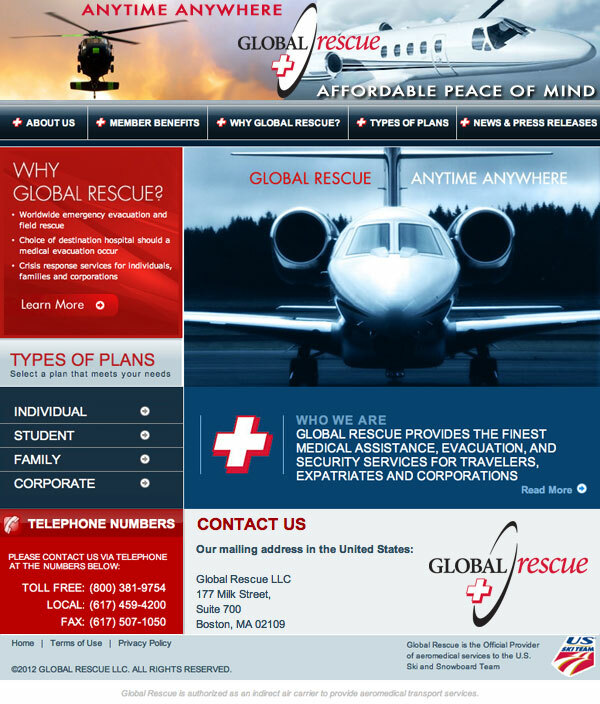 You can find a lot of information about Global Rescue products and services on their website at www.GlobalRescue.com. No matter if it’s your first or fifth time hunting in Africa, unavoidable accidents do happen. Whether a medical or security emergency, an evacuation from a remote part of Namibia could cost well over $100,000. I strongly recommend that anyone traveling to hunt purchase a membership with Global Rescue, the only crisis response company that provides hunters with medical and security evacuation and consultation services anywhere in the world, even the most remote areas. Their deployable teams of paramedics and special operations veterans, backed by on-staff physicians and the specialists at Johns Hopkins Medicine, will get to you wherever you are, by any means necessary, and evacuate you all the way to your home country hospital of choice. Ozondjahe Safaris has a safe where you may store your valuables while in camp. It is a good idea to bring a combination of cash, traveler’s cheques and Debit/Credit cards. The Namibian Dollar (NAD) is the national currency, however the South African Rand which has the same monetary value is more easily obtainable and is accepted everywhere in Namibia. So I would recommend exchanging your currency into South African Rand instead of Namibian Dollar. Denominations in 200, 100, 50, 20 and 10 NAD bank notes. 5 and 1 NAD only in coin form. To view images of these banknotes, click here. Bring cash in US$ or Euro and a small amount of local currency. Small denominations of US$ and/or local currency is always useful for tipping, purchasing small items, etc. Credit/Debit Cards, for your convenience Ozondjahe Safaris is equipped to accept credit/debit cards (Visa, Mastercard and Maestro). If you intend on using your credit card for payment in Namibia, you should inform your bank or credit card company in advance of your safari about your destination(s) and the dates that you will be traveling so that they can remove any automatic locks that may be put into place for your protection during your trip, especially when making large payments. Most shops and hotels accept credit/debit cards with a Visa logo or American Express cards. A credit card generally offers a higher degree of protection from fraud than a debit card, also a debit card charge is deducted automatically from your bank account whereas the credit card offers you the opportunity to review the charges on your statement prior to paying the bill. While in cities you will be able to draw cash from most major bank’s ATMs; however there is usually a limited amount that can be drawn out each day which varies from bank to bank. Although it may be time consuming I believe that you are better off going into a bank to get cash from a debit or credit card. As far as choice of credit card is concerned in Africa Visa and American Express are much more widely accepted than MasterCard. Namibian banks are usually open from 9am to 3:30pm on weekdays and from 9am to 11am on Saturdays. Overseas many financial institutions are on the CIRRUS system which means to be able to use your credit/debit cards, not just at an ATM but for ALL purchases, in many cases you will be required to have a pin number. Call your bank or credit card company to get a PIN number issued for your card(s) before you leave. Make sure your PIN number is only four digits in length as some international credit card machines and ATMs can only handle four digit PIN numbers, also some do not recognize the “0” as a number. You should inform your bank or credit card company in advance of your safari about your destination(s) and the dates that you will be traveling so that they can remove any automatic locks that may be put into place for your protection during your trip. 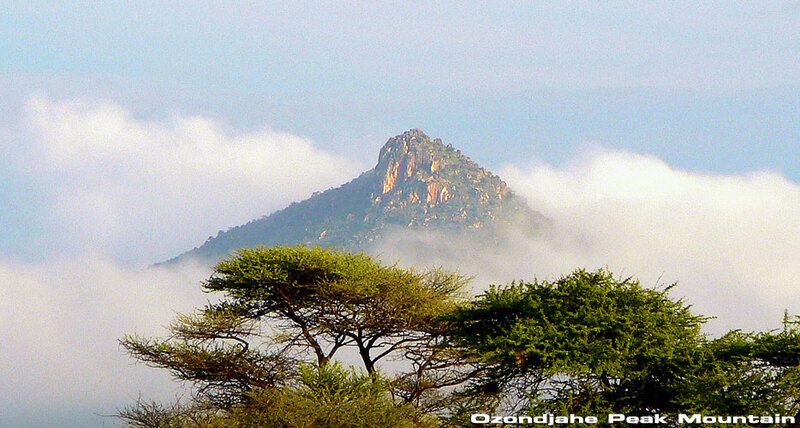 Ozondhaje Safaris does not accept personal checks, traveler’s checks and bank certified checks as payment. If you are confident in Ozondjahe Safaris as many of our clients are, you may consider making arrangements to send a bank wire transfer of an agreed upon amount a few weeks prior to your safari to cover a good portion of your estimated trophy fees. It is a common practice, it may save you the hassle of carrying so much money. Before instructing your bank to wire the funds, make sure there is ample time for the funds to get to our bank before you arrive for your hunting safari. Cell phones are now more common than land lines in Namibia and the cell reception at Ozondjahe Safaris is quite good within most parts of our territory. Contact your cell phone provider for international calling plans and connectivity of your cell phone overseas. We have a phone landline at the lodge for our guests to use, there is a charge for international phone calls and faxes (tel/fax US$2 per minute). Free WIFI in the common areas of the main house and pool house. The office at the lodge has a computer with an internet connection which our guests can use free of charge as well. Namibia country dialing code is 264. For Ozondjahe phone number and email, click here or visit our Contact Us page. Electricity, the Namibian standard is 220/230 Volts AC 50 Hz, three-pin 15 amp outlets however you will find the Standard European 220 Volts, two-pin outlets at Ozondjahe Safaris. Ozondjahe Safaris has a full time electricity supply and makes use of a generator as a back up in case of electricity supply failure. 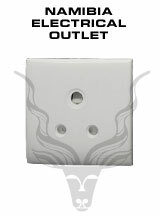 Namibia Electrical Outlet – Namibia standard is 220/230 Volts AC 50 Hz, three-pin 15 amp outlets. 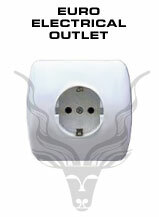 European Electrical Outlet – European standard is 220 Volts, two-pin outlets. 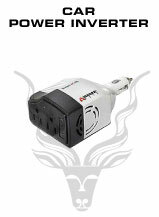 Click here for a worldwide voltage guide. 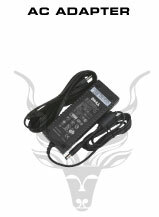 AC Adapter – For your devices such as cameras, video cameras, computers, etc. that make use of an AC Adapter you might not need a power converter from 110V to 220V to use your 110V portable devices in 220V foreign countries outlets. This is especially true for more recent devices. Just check behind the AC Adapter box and check the power INPUT, if it reads INPUT : 100-240V : 50-60Hz your device can safely be used anywhere where the current ranges from 110V to 240V as the AC adapter can handle dual voltage, acting just as a power converter. 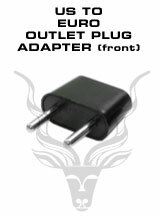 You will however need to use an American to European and / or Namibian outlet plug adapter to connect your device to the appropriate foreign outlet. US Plug – To be plugged in a 110V American outlets. 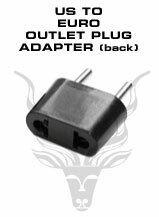 American 110V to European 220VAdapter and Converter – For your devices such as electric tooth brushes, electric razors, hair dryers, etc. that do not make use of an AC Adapter you more than likely will need a power converter from 110V to 220V to use your 110V portable devices in 220V foreign countries outlets. Use any 110V portable devices in 220V foreign countries outlets by such power converter which will convert the 220V to 110V, so you can use your devices from the US that were made to work with 110V. 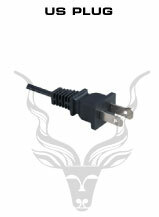 Even though made to plug in European two prong outlets, such converter can easily be used in conjunction with a European to Namibian outlet plug adapter to be utilized in Namibia. 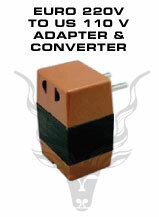 A Namibian 220V to American 110V adapter and converter will be much more difficult to find and expensive to purchase. 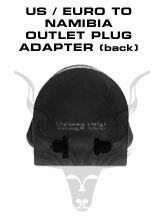 American / European To Namibia Outlet Plug Adapter – To be plugged in a 220V Namibia outlets. Will accept American and European plugs. 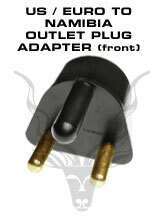 American to European Outlet Plug Adapter – To be plugged in a 220V European outlets. Will accept American plugs. Car Power Inverter – A power inverter will allow you to use and charge your electrical devices that requires an AC power supply in a car. While traveling, I strongly recommend that you carry all valuables, essentials (such as medications) and wear or pack at least one change of clothing for the safari and hunting boots in your carry on luggage in case your luggage is delayed or lost. Should you be traveling as a couple, it is a good idea to take two smaller bags rather that one larger piece of luggage and to split your belongings evenly, including ammo, between the two bags in case of delayed or lost luggage and to distribute the weight of the ammunition so that you do not go over weight. When departing from Africa, airlines are more likely to make you pay for overweight luggage or enforce other rule violations (this is their last opportunity to squeeze a few more dollars out of you and it can be very costly). Be aware that what may have been acceptable luggage weight or size when departing from the US or Europe may be unacceptable on the exact same airline when departing from Africa. If you intend to bring souvenirs or gifts back with you, it’s a good idea to plan for space and weight prior to leaving on your trip. Airline approved lockable hard gun or bow cases must be used while transporting weapons on airlines. You must carry your ammunition separate from your rifle in your checked luggage in one or more separate lockable containers and in their original packaging. TSA approved luggage locks, combination padlocks for all of your luggage, if airport security personnel need to inspect your checked bags, they no longer need to cut your locks or force the bag open and risk damaging it. These locks allow airport security to open your locks and re-lock your bags without you having to be present. You may wish to include inside the luggage tag a copy of your complete itinerary with a note in red below the contact information that says “see itinerary inside this tag”. It is not a bad idea to have a copy of this information on a piece of paper that you put inside your luggage as well, which can easily be found, should they need to open it if your luggage tag is missing. Handbags, fanny packs and backpacks are NOT good places to keep anything important or valuable as they are easy targets for thieves. Wearing a money belt, travel wallet or pouch that closes with a zipper under your clothing (around you waist, neck or leg) to secure your valuables is a good idea especially if traveling with a large amount of cash. It should be big enough to carry all or some of your money (cash, traveler’s cheques, credit cards) and documents (passport, ID, airline tickets, contact information of your outfitter and PH, etc) without being bulky or uncomfortable. If that is the case you may consider using a couple of these travel accessories and separating the documents you will need and not need access to while traveling. Should you be traveling with a companion, you might consider each carrying a portion of the valuables. Leave all the unnecessary credit cards and other wallet clutter safely at home. While in Namibia, no matter how safe you think it is, no car with your belongings should EVER be left unattended, not for a minute even in the presence of a third party security guard. It is best to be very diligent and aware that opportunistic crime is rife even though Namibia is a safe country. – Camera, lenses, flash and film, if not digital. If your camera is digital you might consider bringing a second memory stick, charger and/or batteries. This extensive packing list is very complete and should be used as a guide to help you with your preparation. Adapt this list according to your preferences, weather and length of your trip, etc. Safari hunting wear should be comfortably fitting and made of a sturdy fabric. Laundry is done on a daily basis so packing should be done with this in mind. The color of your hunting clothes from hats to boots including your backpack should be green, brown, khaki, olive, or neutral. Camouflage clothing is allowed in Namibia. Avoid light shades of any color and clothing that makes noise. Depending upon the time of the year, darker colored clothing might be recommended such as darker greens or khaki for the months of February, March and April. I recommend layering clothing since temperature changes from dawn to dusk can be significant year round in Namibia, typically varying 35° F (20° C) from day to night. You should test your layers before your trip, your outer layer should fit easily over the inside one(s) without binding and bunching up. Do not bring clothing items that you are very fond of, the African bush is unforgiving. Should you be traveling during the rainy season it is best to have at least some fast drying synthetic clothing that maintains its warmth when wet. – Long pants, pants should be comfortably fitting and made of a sturdy fabric, the thicker and tighter the weave the stronger and more impenetrable to thorns and insects. I suggest cotton; it is great in warm weather. Cargo pants with lots of pockets are a great functional piece of clothing. – Shorts, some hunters are comfortable wearing shorts for hunting in warm climates which is fine but there can be drawbacks. I usually advise against wearing shorts for hunting due to the abundance of sharp thorns, twigs and nasty grass which can be hard on your legs. A pair of shorts for camp or travel may be good to bring if the weather is hot, but the choice to wear them while hunting is yours. – Shirts, long sleeved shirts for hunting will protect you from the sun and the bush to some degree. I suggest cotton; it is great in warm weather. – Hunting boots, you should bring two pairs of well broken-in hunting boots or one pair of hunting boots and one pair of trail shoes. Your footwear should be comfortable, light weight, preferably leather, darker in color and have the advantage of a quiet sole for stalking or tracking. – Socks, high quality socks are a good idea and will help minimize the risk of blisters. – Gloves, that are functional for hunting, preferably leather and dark in color. Fingerless gloves used for biking or weightlifting are ideally suited for shooting and reloading and at the same time they will protect you hands if crawling through the bush. – Hat, a suitably colored baseball cap and/or wide brimmed safari hat for added sun protection for your neck and ears. – Bandana, a great multi-purpose item, sun protection (head or neck), wet it will cool you off, handkerchieve, dust mask, etc. – Gaiters in leather or canvas, above the ankle to keep your boots and socks free of nuisances such as sand, prickly seeds and sharp grass or to the knee to offer added protection from nuisances, such as bush, sharp weeds, snakes, etc. – Sun block with high SPF, I recommend waterproof it lasts even if sweating and unscented is always a good idea. No matter how much you hate the sticky stuff, the sun is very intense in Africa even in the winter. Perhaps because people don’t feel as concerned about sunburn when the air is cooler they just don’t take the sun as seriously, but I have seen the worst sunburns during the winter in Africa. – Ziplock bags, generally very useful and versatile, a great way to contain items that may leak in your luggage. Ozondjahe Safaris has a first aid kit and basic medications are available such as aspirin, ibuprofen, anti-diarrhea pills and band aids. If you bring prescription medication they should be packed in your carry on luggage and you should have enough to last you through your trip. They should be prescribed in your name and be in their original prescription bottles to avoid problems at customs. If you are carrying liquid medication, be sure to place them in a quart size zip lock bag for airport security. – Prescription glasses and/or clear shooting glasses with strap and case. Will protect your eyes, day or night, against sand, thorns and insects. At the check in counter at the point of departure, insist that the agent check your firearm through to your destination airport. Your bag tag issued by the airline should read, for example: New York – Frankfurt – Windhoek OR Atlanta – Johannesburg – Windhoek (this is sometimes not possible if the airlines that you are using do not have baggage agreements between eachother, inquire about this before purchasing your tickets). Physically check baggage tag issued by the airline to ensure that it has been correctly printed and attached. Inquire if a colorful ‘in transit tag’ is necessary when traveling through another country. Important changes to requirements that the U.S. government has implement for hunters traveling from the United States of America with firearms and ammunition to hunt outside the country. If a hunter wishes to temporarily export three or fewer non-automatic firearms from the U.S. and 1,000 or fewer cartridges at the time of his/her departure from the U.S., he or she must declare the articles to a U.S. Customs and Border Protection (CBP) officer, present the Internal Transaction Number (ITN) obtained from the submission of the Electronic Export Information in the Automated Export System (AES) and present the firearms and/or ammunition for a visual inspection to the CBP officer at the port of departure from the United States. The firearms and ammunition to be exported must be with the individual’s accompanied or unaccompanied (checked) baggage or effects. Firearm/ammunition owners are newly being required to submit Electronic Export Information (EEI) in the Automated Export System (AES) to obtain an Internal Transaction Number (ITN). For many years, the State Department’s International Trafficking in Arms Regulations (ITAR) have allowed Americans to temporarily export up to three non-automatic firearms and up to 1,000 rounds of ammunition without a license, as long as the firearms were declared and presented to a CBP officer (also known as a Directorate of Defense Trade Controls (DDTC) license exemption). Previously, the owner of the firearms/ammunition would bring the firearms/ammunition to a CBP office at some point before the trip and would complete Customs Form 4457 – a form that can be completed for any personal property and that is normally used to prove that the traveler owned the property before going abroad. The form protects a traveler from paying import duties on items already owned. The owner of the firearms/ammunition would retain the form and present it upon reentry if needed. Form 4457 will no longer satisfy the requirements for bringing firearms/ammunition out of the country. Additional information about the new requirements can be obtained from the Immigration and Customs Enforcement website: https://www.ice.gov/cpi/faq. For more help regarding Traveling outside of the U.S. – Temporarily taking a firearm, rifle, gun, shotgun or ammunition abroad for hunting purposes go to the U.S. Customs & Border Protection website: https://help.cbp.gov/app/answers/detail/a_id/323/kw/Temporary%20Firearm%20Export/sno/1. Proof of firearm or bow ownership which is used also as a proof of export and sometime can replace the gun license as some countries, including the United States, do not issue gun licenses. Some countries do not require it; though we recommend while traveling to always carry it with you along with a copy, in case of flight delays, change of route… It is mandatory to have for some countries that usually want the proof in the form of a custom declaration letter from the country of origin for each firearm. You can register your firearms with the Department of Homeland Security U. S. Customs and Border Protection, you can download the form of the Certificate of Registration for Personal Effects Taken Abroad (CBP form# 4457) along with its instructions directly at http://www.cbp.gov/xp/cgov/toolbox/forms/. Bring along the original as well as a copy that can be handed out to custom officials. Should the link to the Department of Homeland Security U. S. Customs and Border Protection no longer exist please visit the home page of CBP at www.cbp.gov and just simply browse through their web site to find the link to forms and look for form# 4457? I would suggest filling out two separate forms, one for your firearm(s) and possibly one for your personal item(s) like binoculars, camera(s) and other valuables as it will prove that you brought those along on your trip and that you did not purchase of these items overseas. Please make sure to not only look at the procedures for importation into the country in Africa where you will be hunting but it is also very important to look at the countries that you may be transiting through as they have their own laws, regulations and procedures that you will have to adhere to. Anyone traveling through Europe and no matter the airline(s) that you are traveling on, you or your hunting travel agent should contact each airline at time of booking to declare that you will be traveling with firearm(s) and ammunition for sport use and get the necessary authorization if necessary. Temporary importation of firearms and ammunition into Namibia is free of charge and the process is quick and easy. Should you be traveling with bows and arrows to and/or through Namibia, there is no required permit or charges. Although it is not required by Namibian Customs, we recommend while traveling, especially via South Africa, that you carry your gun license with you. Some countries, including the United States, do not issue gun licenses, in this event a copy of proof of ownership should be carried instead. Hunters entering Namibia with firearm(s) and ammunition must complete a Temporary Import/Export Permit Application Form for all firearm(s) and/or ammunition in their possession. Click here to print a copy of this form, we would strongly recommend that you fill out the form beforehand, leaving it unsigned and carry it with you to Namibia, along with a second copy for yourself. As your hunting outfitter, we do not need to receive a copy of this form. For the convenience of hunting clientele visiting Namibia and bringing along their personal hunting rifles, the Namibian Police has implemented an online firearm import application facility at Hosea Kutako International Airport. Please find attached the Requirements for Import Permit for Hunting Purposes: Namibian Police Force by clicking here. Please find attached the Temporary Import/Export Permit Application Form for submission prior to arrival in Namibia which must be emailed to the Namibian Police at firearmairport@nampol.na. Click here to print a copy of this form. 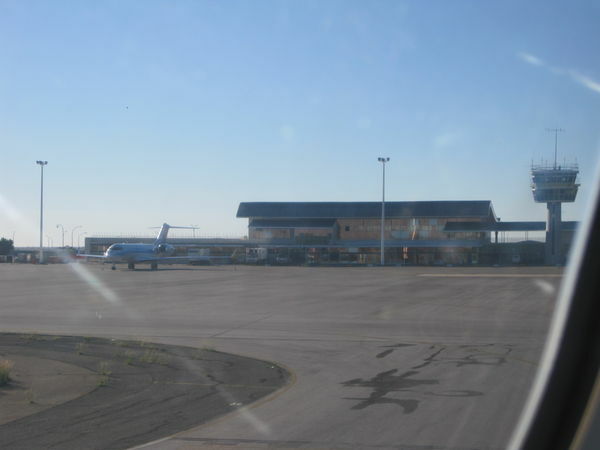 Please note that at this stage, this procedure is only applicable to Hosea Kutako International Airport in Windhoek. This application form must be submitted upon entry while declaring your firearm(s) and ammunition in a small office located in the baggage claim area of the airport, where your temporary import/export permit will be issued. At the time of declaration of firearm(s), hunters will have to present and show a copy of their hunting permits to police officials and will also be required to supply a “Letter of Invitation” on company letterhead from their hunting outfitter. It is a supporting document from the hunting outfitter that you are visiting for the purpose of trophy hunting indicating the farm name and number. This letter serves as an invitation and confirmation that Mr./Mrs./Ms. ………. from ………. [COUNTRY] will be trophy hunting at OZONDJAHE SAFARIS, on farm OZONDJAHE, number 316, District of Otjiwarongo in the Otjozondjupa Region of Namibia from ………. to ………. [DATE OF PLANNED HUNT MM/DD/YYYY]. 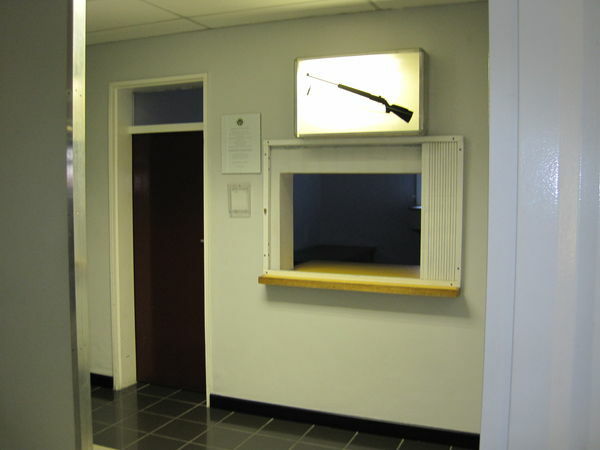 The firearms declaration office is located directly next to the baggage claim area on the left handside, the process to obtain your temporary importation of firearms and ammunition permit could not be more hunter friendly and usually only takes a few minutes. A maximum of one hundred (100) rounds of ammunition may be imported per hunting rifle, however you may encounter greater restrictions from the airline(s) you are traveling on or country you are departing from or other countries you may be visiting or transiting through. Only ammunition for the specific caliber(s) you are bringing may be imported. There is no limit to the number of firearms per license holder that may be imported safely stored in one locked case into Namibia for trophy hunting purposes, however if traveling through South Africa a maximum of two firearms are allowed even if you are just in transit. Some European countries also have greater limitation than Namibia as to the number of firearms which can be brought into their country even while in transit. Black powder rifles are permitted in Namibia, however it is illegal to transport on commercial airlines black powder and percussion caps. These may be purchased in Namibia but it is best to contact us to organize for it well prior to your hunt as it may need to be special ordered and could take some time. No fully automatic firearms are allowed. Other self-loading, considered semi-automatic firearms are permitted in Namibia, but you can expect questions at the airport upon importation. Namibia does not have a minimum caliber requirement for rifle hunting and rely by law on minimum energy (Eo – muzzle velocity). Smallest caliber recommended by NAPHA 7 mm (.284). No weapons which fall under military categories. Should you be traveling with firearms and ammunition in transit through South Africa, not leaving the airport with your firearms and ammunition, you will not be required to go through the temporary importation process and fill out the South Africa Firearms Permit Application Form (SAPS 520 Form) as long as the airlines transfer your baggage and/or firearms and ammunition through to your next or final destination and you stay in the airport transit area never clearing customs. It is however critical that you check with and confirm with the airlines involved before departure to make sure what their procedure is for the transfer of baggage and/or firearms and ammunition. Also once at the airport counter make sure to tell the airline check in agent to check your baggage and/or firearms and ammunition all the way to your final destination. 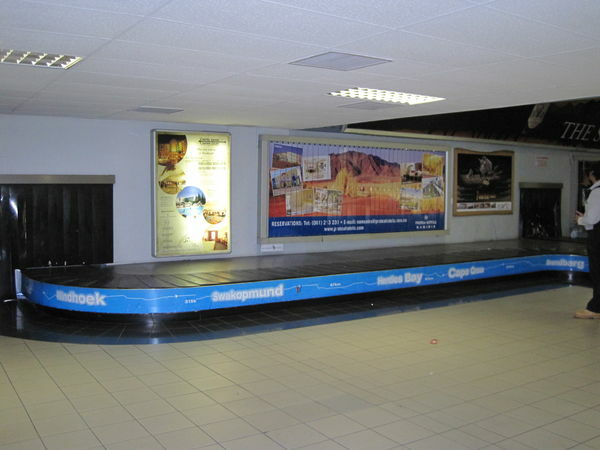 In the event that your airline company will not transfer your baggage and/or firearms and ammunition to your connecting airline, then you will have to collect your baggage and/or firearms and ammunition and go through the entire South African clearing process, and in this case you must know that all South African firearms and ammunition laws, legal limitations and requirements will apply even if you are not staying or hunting in their country. When booking your flights to Africa, please insure sufficient time to go through the temporary importation process to clear custom in South Africa even if you will only be staying in the airport transit area never clearing customs. 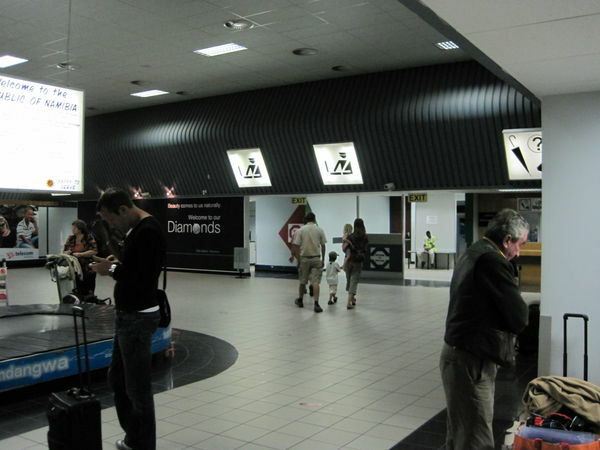 While transiting through South Africa if an unscheduled layover occurs, due to a changed or canceled flight, some hunters might encounter problems at customs if they do not have the appropriate papers from their hunting outfitter(s). Firearms and ammunition have been impounded due to this exact situation. South African Customs requires a Letter of Invitation from hunting outfitter(s) to handle gun permits. In order to prevent such an occurrence, as a precaution always request from your hunting outfitter(s) in the country where you are going to be hunting to provide you with a South Africa Letter of Invitation. We recommend that you print a couple of copies and carry them with you while traveling to your destination as it needs to be on your person. Expect some delay at the South African Police Services (SAPS) office at the airport especially if there are a large number of hunters getting their temporary firearm import permits, which is likely the case during the peak of the hunting season (June through August). The process is bureaucracy at its best and can take anywhere from 20 minutes to well over an hour or even two. The most important thing you can do to expedite the process is to be well prepared to help avoid prolonging the time it takes or the possibility of fines. Should your application for a temporary import permit be denied; your firearms and ammunition will be confiscated and returned to you upon your departure to your country of residence. Should a firearm not be declared and a temporary import permit not issued, and you proceed through customs with a firearm anyway, you will face severe penalties and possible arrest. Temporary importation of firearms and ammunition into South Africa is free of charge. Should you be traveling with bows and arrows to and/or through South Africa, there is no required permit or charges. You can find up to date information on importation of firearm into South Africa by going directly to the South African government web site of the South African Police Service (SAPS) by clicking here. The South Africa Firearms Permit Application Form SAPS 520 (SAPS 520 Form, application for a multiple import or export permit / temporary import or export permit / permanent import or export permit / in-transit permit for personal use) must be submitted to the designated firearms officer upon entry while declaring your firearm(s) and ammunition where your temporary import/export permit will be issued. Hunters entering South Africa with firearm(s) and ammunition must complete the South Africa Firearms Permit Application Form (Form SAPS 520) for all firearm(s) and/or ammunition in their possession. Click here to get a copy of this form, we would strongly recommend that you fill out the form beforehand, leaving it unsigned and carry it with you to South Africa, along with a second copy for yourself. Your hunting outfitter does not need to receive a copy of this form. You can also download the South Africa Firearms Permit Application Form, SAPS 520 directly from the South African government SAPS web site by clicking here. Please make sure to complete the form and all sections as instructed otherwise your application will not be approved. You can download the instructions for how to complete the SAPS 520 Form by clicking here. You can find up-to-date information on importation of firearm(s) into South Africa by going directly to the government web site of the South African Police Service (SAPS) by clicking here. You can also download the instruction on how to complete the South Africa Firearms Permit Form, SAPS 520 directly from the South African government SAPS web site by clicking here. You can find all the forms and instruction files from the South African Police Service on their web site by clicking here. Should the links to these SAPS pages no longer exist please visit the home page of SAPS at www.saps.gov.za and just simply browse through their web site to find the link to the page on information on importation of firearm into South Africa? At the time of declaration of firearm(s) at the SAPS office, you will be required to supply a Letter of Invitation from each hunting outfitter(s) you will be hunting with as well. It is a supporting document from the hunting outfitter(s) that you are visiting for the purpose of hunting. If you will be hunting with several hunting outfitters in South Africa or other countries, you will need a Letter of Invitation from each one of them. Request from your hunting outfitter(s) a signed Letter of Invitation on company letterhead for the Central Firearms Register, click here to view a sample of this document in Word format. There is a limit of two firearms per hunter that may be imported into South Africa for trophy hunting purposes, however hunters cannot bring in more than one firearm per caliber. An exception to this may apply for shotguns where more than one of the same caliber may be allowed for bird hunting. The client must provide an acceptable written motivation as to why they require more than one shotgun to the SAPS office upon declaration of firearms. A maximum of two hundred (200) rounds of ammunition may be imported per firearm, however you may encounter greater restrictions from the airline(s) you are traveling on or country you are departing from or other countries you may be visiting or transiting through. Black powder rifles are allowed for hunting purposes in some provinces of South Africa, however it is illegal to transport on commercial airlines black powder and percussion caps. Any hunter wanting to transit with a handgun must submit a letter of intent with their SAPS 520 Form stating the handgun will be used only for hunting purposes. Hunter also needs to produce a letter from a registered association of his/her country of origin, stating that he/she is a registered member of the association and that the handgun will be used exclusively for hunting purposes. The application has to be submitted to the Central Firearms Control Register before arriving in South Africa as it needs to be pre-approved. Your application must be logged by the Central Firearms Control Register at least 21 days prior to your arrival in South Africa to enable the South African Police Service sufficient time to process the application and to submit the permit to the applicant to an address outside the borders of the Republic of South Africa. It is legal for hunters to travel with bows and arrows to and/or through South Africa, there is no required permit or charges. Crossbows are allowed for hunting purposes in some provinces of South Africa, check with your hunting outfitter. No automatic, semi-automatic, lever action or slide action firearms are allowed. A semi-automatic shotgun for hunting purposes may be allowed if an application is made and granted through the Central Firearms Register at least 21 days prior to your arrival. A person must be 21 years of age to import firearm(s) and ammunition. It is possible for someone under the age of 21 to do a hunting safari in South Africa, however another hunter over the age limit must import a firearm for their use or they can rent/borrow one from the hunting outfitter. Please note that only the Central Firearms Control Register in Pretoria South Africa can authorize special applications for example a second rifle or shotgun of the same caliber or a semi-automatic shotgun. These applications must be made and granted through the Central Firearms Register at least 21 days prior to your arrival. Special Notice: The issuing of the SAPS 520 is a free service and the South African Police Service in an effort to control bribery asks hunters NOT to pay anybody involved in handling firearms from the time of arrival in South Africa right through until you receive your firearms and permit from the SAPS. Clients that are paying the various airline staff, security staff, or porters involved are actually perpetuating this problem. Please note however that there may be a handling fee charged by airlines and/or security companies for the handling of handguns, and some airlines have started charging a handling fee for all firearms. We suggest checking with your airline with regard to any official fees that may be required. The Professional Hunters Association of South Africa (PHASA) recommends that when ever possible that the actual temporary import permits for firearms be obtained prior to your arrival. The Professional Hunters Association of South Africa (PHASA) recommends a minimum of 3 hours of time between flight connections at Johannesburg International Airport. If traveling in a group get temporary importation permits in advance, everyone in the group can expect to be delayed at Johannesburg International Airport for up to 3 hours. RiflePermits.com is a small company in South Africa that works hand-in-hand with the South African Police Services (SAPS) to provide “import/export” or “in-transit” permits for your rifle(s) before you arrive in South Africa. They offer a good service and you will find valuable information regarding this process on their website at www.riflepermits.com. Below are the instructions to apply for the license to take weapons through Frankfurt Germany. Should you be traveling with firearms and ammunition in transit through Netherlands on your way to Africa, click here to go the Royal Netherlands US Embassy’s website in Washington DC to read on this topic. You will also find there the mandatory Consent Application Form that the Dutch customs want you to file for each transit through the Netherlands if you are carrying firearms and ammunition. Make sure to prevent your firearms from getting impounded by applying for the consent form for both the outbound and the return transit through Amsterdam. Customs are not going to even know that you are in Amsterdam as you are not entering the country. However, the Dutch Airport Police, who are the ones that are doing spot checks regarding the consent form, may contact you at the gate of departure from Amsterdam and ask to see your consent form. If you are unable to show them the consent form then your firearms and ammunition will be held by them until you get a consent form to them. Further, Northwest Airlines and their partners KLM have also received notice that check in agents here in the USA should be checking with passengers at check in to ensure they are in possession of the consent form before loading the firearms and ammunition. Hunters have reported that it is taking a full six weeks to receive their transit permit, so be sure to submit your application with plenty of time for processing. In order to process the transit application the Dutch Customs is also demanding a Letter of Invitation from each hunting outfitter(s) you will be hunting with as well. It is a supporting document from the hunting outfitter(s) that you are visiting for the purpose of hunting. Request a signed Letter of Invitation from your hunting outfitter(s) on company letterhead. The procedure to obtain the consent for your firearms and ammunition is rather straight forward, it does not cost all that much as it is a matter of faxing the Consent Application Form to the Netherlands which is not long to complete and you should be able to get a reply from the Dutch authorities within 2 or 3 business days. Should the link to this page no longer exist or should you have further questions please visit their home page at dc.the-netherlands.org or just call the Royal Netherlands US Embassy in Washington DC directly so they can help you. All airline passengers transiting through the Netherlands with firearms must obtain a special consent form issued by the Customs office in Groningen or face having their guns confiscated. The Royal Netherlands Embassy in Washington DC has confirmed that this new form is required to avoid denied transportation at check in and/or confiscation of the weapons in Amsterdam. Check in agents for KLM Royal Dutch Airlines and their American partner, Northwest Airlines, have been advised of the new ruling and will be requesting the approval form at check in. Importantly, this consent form is required even if you are not flying Northwest or KLM but are merely transiting through the Netherlands on any airline. Travelers must submit a completed consent form application to the Douane Noord Office in Groningen, tel. 011 (31) 45.5743031, fax. 011 (31) 88.1513182 for each transit through the Netherlands. That means many travelers will need two applications for a round trip, one for the flight to Africa and one for the return flight back through Amsterdam. The completed consent form application must be faxed to Douane Noord Office together with a copy of the information page of your passport, make sure it is a clean copy and that all details are readable with a copy of firearms license(s). US citizens may submit a Certificate of Registration for Personal Effects Taken Abroad (CBP form# 4457) in lieu of a firearms license or secure a letter from their local sheriff / police department confirming they are the legal owner of the firearms. Approval will take a minimum of three weeks to process and a copy of the approved consent form will be faxed to you. If time permits the original consent form will be mailed; otherwise, the original form will be sent to Customs at Schiphol Airport. Arrowheads of any kind are illegal to possess in the Netherlands as are all folding knives. Under no circumstances should you attempt to travel or transit through the Netherlands with any kind of arrowheads including broadheads or folding knives even in your luggage. There are no provisions for acquiring a transit permit for such items as there is for firearms and ammunition. Bowhunters should avoid this route. You will be met by us at Hosea Kutako International Airport and taken by car (a three hour drive) to Ozondjahe Hunting Safaris. Under normal circumstances it takes about an hour from getting off the plane to departing from the airport. 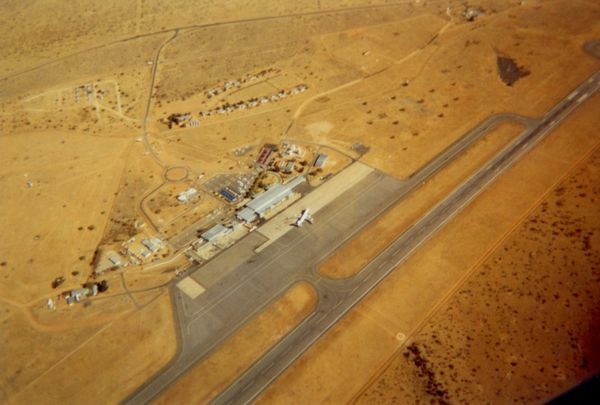 Hosea Kutako International Airport (Airport Code WDH), located 28 miles (45 kilometers) east of the city of Windhoek, capital of Namibia. View of the airport from the plane. As you can see it’s quite small and easy to navigate. Tarmac upon arrival at Airport. Once you have gone through Customs to get your passport stamped, you will get to the baggage claim area to pick up your bags and guns. Oversized luggage as well as firearms cases do not come out on the carousel, they will be hand delivered by someone who will drop them in the baggage claim area from the two doors located on both sides of the carousel, so look out for that. These doors are located to the left and right of this picture. 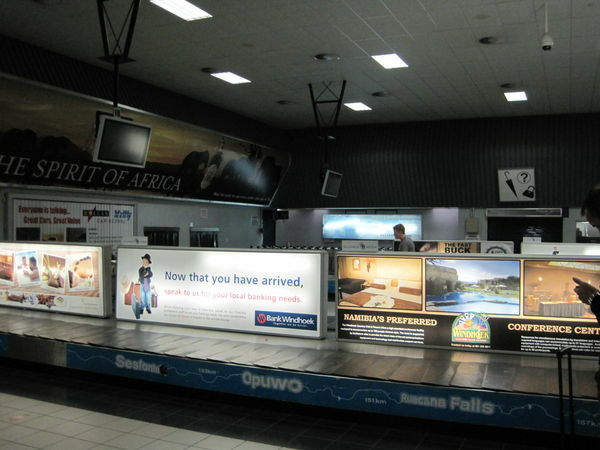 From the baggage claim area you will exit through the Customs and Excise passage area where you will be met by someone from Ozondjahe Safaris holding a sign in the arrival hall of the airport waiting to pick you up. Upon meeting our driver in the arrival hall, you will exit the airport to get to the parking area. Parking and car rental area located right in front of the airport. 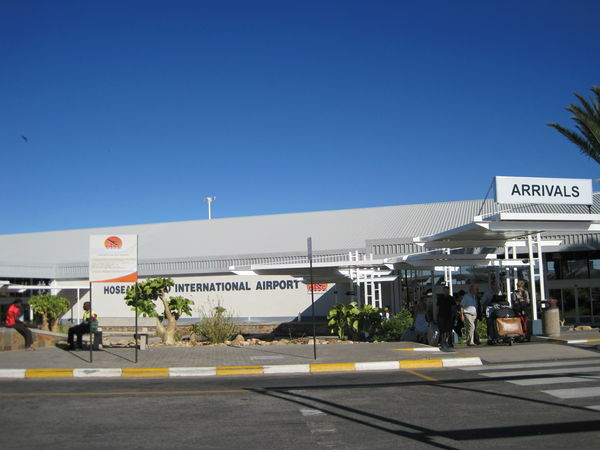 Arrivals at Hosea Kutako International Airport. Departures at Hosea Kutako International Airport. Guests are picked up at the airport by Ozondjahe personnel, unless they have their own vehicle for further travel or have chartered a plane. Ozondjahe Hunting Safaris can be reached by chartered aircraft with an hour and 15 minutes flight time which lands on our private runway a few minutes from the lodge. – Make sure to rent your car from a reputable company that has been in business for some time and get full insurance coverage from the car rental company. – IMPORTANT: Namibia does not allow credit card payments for petrol or diesel. By law you must use cash so you have to be prepared with Namibian Dollars or South African Rands which is also accepted and of the same value as Namibian Dollars. 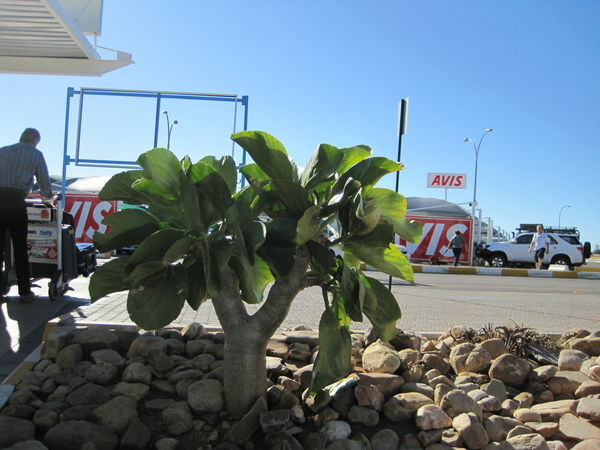 – Most car rental companies in Africa will not let you take their cars into other countries, if you plan to do so make sure that your contract states that this is allowed and that the car rental insurance covers it. You may need to specify countries. – Find out what their vehicle replacement policy is in case your vehicle becomes disabled at any stage of your trip. – Most of the rental cars will not have an automatic transmission, so for some this might be an issue. If you are not comfortable driving a stick shift make sure to familiarize yourself with it prior to your trip. – Make sure that you have at least one full good spare tire in the car and check the overall condition of the car and the spare. If you intend on traveling off road, long distances or remote areas, make sure to have at least two good spare tires… A couple of cans of tire filler can be also a great idea. – Make sure that all the fluids of the car are topped off. – In the first 10 minutes of driving, really pay attention to the way the car handles and what the engine sounds like. If it does not feel right, return it for another vehicle. – Always carry plenty of extra drinkable water in the car, this can be used for the car or for yourself if stranded. – If you do not need a 4×4, I would not recommend getting one unless you are familiar with driving one. – Driving on dirt roads can be delicate, keep your speed down. It is easy to loose control on dirt or gravel roads. In many countries, and particularly in rural areas, roads are often poorly maintained. – Beware of pot holes, they are not always easily seen and you never can anticipate the size of the hole just by looking at it. I have seen what appear to be small holes collapse into giant holes that have engulfed the entire front end of a car (this happens most often during and just after the rainy season). – Beware of police speed traps. – It’s not unusual to come across domestic animals such as sheep and cattle or game, this is the number one cause of accidental deaths on the road in Africa, especially at dusk, dawn and at night. Stay alert, always use your seatbelt and avoid traveling at these times whenever possible. – Make sure to get several road maps. From personal experience I know that the inaccuracy of maps in Africa is probable. Guests are picked up at the Hosea Kutako International Airport by Ozondjahe personnel unless they have their own rental vehicle or have organized their own transportation for some reason. It is about 2 and a half hour drive on excellent paved roads. From Windhoek take the main road B1 going North towards the city of Okahandja, about an 1 hour drive from Windhoek, then drive further North onto Otjiwarongo. About 30 kilometers prior to arriving in Otjiwarongo, Okahandja to turn about 1 and a half hour drive, make a right at the T junction towards the city of Okakarara, road C22. From the right turn at the T junction, we are about 10 kilometers. The first big sand color painted brick entrance with a black gate to Ozondjahe lodge is on the right. You will see a palm tree lined driveway going up to the lodge. Just enter and drive up to the lodge, about one kilometer. From Otjiwarongo, drive south toward Windhoek on the main B1 road for about 30 kilometers and make a left at the T junction towards Okakarara on the C22. From the left turn at the T junction, we are about 10 kilometers. The first big sand color painted brick entrance with a black gate to Ozondjahe lodge is on the right. You will see a palm tree lined driveway going up to the lodge. Just enter and drive up to the lodge, about one kilometer. Normally our guests are picked up at the Hosea Kutako International Airport by Ozondjahe personnel unless they decide they would prefer to provide their own transportation. Going with a major car rental company is usually best. Namibia is a safe country however you should not leave your belongings unattended in your car. It is a great country to travel on your own, the main roads are usually well maintained, all the main arteries are paved and are in very good conditions, much can be done even with a non 4×4 vehicle. 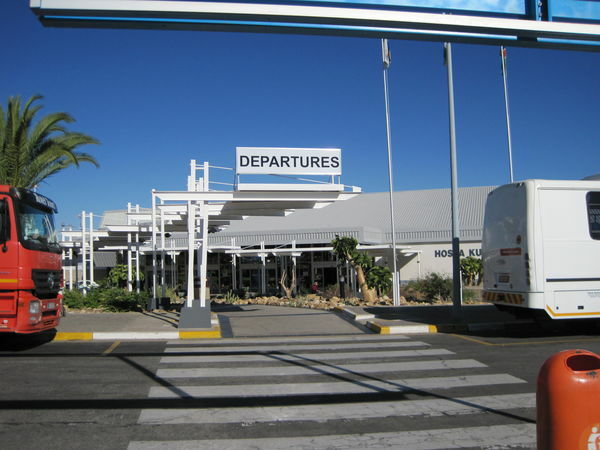 We of course take care of your ground transportation to and from Windhoek airport and Ozondjahe, however anyone looking for private car transfers to any destinations in Namibia, airport pick-up or drop-off, general taxi service in Windhoek or transfers between lodges, I would highly recommend contacting Edward who is punctual, honest, reliable, very reasonable with his prices and a safe driver. We have been using and recommending him for over a decade with only positive reviews. 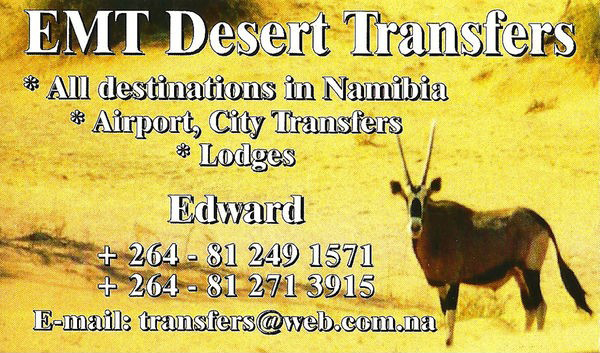 Edward can be reached for his services by email at transfers@web.com.na or on his cell at +264 (81) 271-3915 or +264 (81) 249-1571. When it comes to staying overnight in Windhoek there are lots of options however, I recommend a high quality hotel right in the center of downtown, either the Avani Windhoek Hotel & Casino (the old Kalahari Sands Hotel) or the Hilton Windhoek Hotel, or the cozy Londiningi Guest House a popular bed and breakfast about 3 blocks from the center of downtown or the comfortable Afrika Sun Bed & Breakfast a couple of kilometers from the center of town. A nice bed and breakfast owned by a French lady named Nathalie, she is very nice and really makes you feel at home. Located a few blocks from the center of downtown, you will need a taxi to go to the center of town, a 5 minute drive. Sometimes Nathalie or one of her staff can drive you to town. They have a swimming pool, nice outdoor area and a great breakfast in the morning. Prices are very reasonable. A nice, clean and comfortable bed and breakfast owned by a very friendly Namibian named Eghard who welcomes you on his property. Located 5 minutes from the center of downtown by car, you will need a taxi to go to center of town. They have a swimming pool, nice outdoor area and a great breakfast in the morning. Prices are very reasonable. A good quality hotel located in the center of town, making it ideal for walking around the city, shopping, restaurants… There is no need for a taxi. The Avani in Windhoek has a casino, restaurant and bar. Prices are more on par with international hotel rates. Set in the heart of Namibia’s capital city, Windhoek, the contemporary Hilton Windhoek Hotel is conveniently close to a variety of historical and tourist attractions. All of the modern Guest Rooms and Suites at this hotel are decorated in a warm, contemporary African style. Here are a few links of informative tourism websites that you might find helpful. 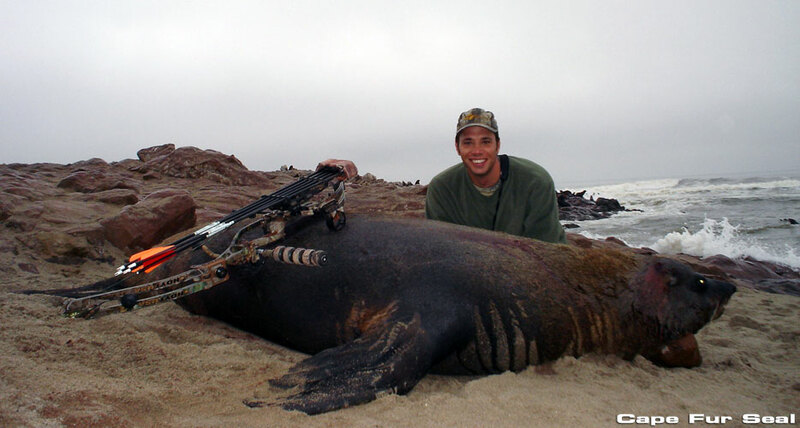 Here is an article that I wrote about tipping to share with hunters going to Africa! Tipping is a good thing, it is a straight forward way to encourage great service. However tipping looses it’s most important purpose when others start deciding or dictating who should get tips, how much you should give or pooling tips and redistributing them however they see fit. These practices do not allow workers to make that connection between their effort and their compensation, after all what is a tip for? The reason is simple, P.H.’s, trackers and camp staff derive much of their income from the tips they receive which creates the incentive for them to perform at their highest level for each and every client. After all we must remember that hunting is a service industry. The custom of tipping has evolved over a long period of time and is responsible for creating an environment of ever evolving higher standards and better quality of service, leaving behind those who are less than hard working. I would like to point out however than if your P.H. is also the owner of the hunting outfit, you still need to give him a tip as you would with any other P.H., based upon your overall satisfaction no more, no less. Here is my tip to you which has nothing to do with tipping! Your behavior has more to do with the outcome of your hunt than your tip. You should know that the outcome of your hunt is highly dependent upon the performance of your entire hunting team and that the effort they put forth from one hunt to another can be drastically different depending on how they “feel” about the hunter as a person. It’s not always about money, just being nice goes a long way too. How important it is that the P.H. and hunting team perceive you positively, for whatever reason, is not something that you will ever hear discussed, but it is really a factor that can play a huge role in how hard the hunting team works for you and how successful your hunt is. From the moment you arrive it is important to go out of your way to have warm and friendly interactions with the staff… and I mean all of them. Remember they work together, live together and are often related to each other, if you are disrespectful to one person they will all know about it in short order. Not to say that you shouldn’t complain if there is something that you’re unhappy about, but I suggest you take it to the P.H. or lodge manager and let them deal with it. A tip should be given in cash or can be given with traveler’s cheques. If a voucher system is used by the hunting outfitter, you may wish to ask the outfitter if it matters if that cash is in local currency or US$. You may be surprised to hear that many prefer US$, which should make it easier for you in terms of knowing what you are giving and not needing to exchange currency, however some still prefer local currency as it is hassle for some workers to exchange money depending on the country. It is always very generous for hunters to bring “extras” (such as clothes, knives, cigarettes, candy, even perfume or chocolates for the lady of the house), however these items should not be considered a tip. If you wish to offer an item in lieu of a cash tip the choice should be that of the recipient, for example you might propose leaving behind a pair of binoculars or a nice hunting knife instead of a cash tip, if the person agrees great, but if they prefer cash, you should be prepared to leave the tip in that form. I do believe that those types of “extras”, given before or shared throughout the hunt, can buy you a lot of good graces; these small gestures are very well received and just a nice thing to do. The only way to prevent getting caught up in these types of situations is to ask the right questions BEFORE you book; ask if they have any type of tipping requirements or pool tips. If they say we ASK that you tip a certain way, you’re probably still okay as many outfitters do have some guidelines in place and for good reasons, (which I will outline below) but if they have strict or inflexible rules or requirements ask to see them before booking and use your best judgment. Most guidelines concerning tipping have arisen out of necessity and are in place to help the hunting outfitter avoid known problems. These problems can range from workers accumulating too much cash through a long hunting season in the bush and the risks associated with having that cash lost or stolen from them. Some workers, with cash in hand, have been known to disappear half way through the hunting season on an unplanned “vacation” for a few weeks, not so good for the next guy who comes to hunt. Another issue is that alcohol problems are rampant in Africa and it is not uncommon for a worker to binge drink given a pocket full of cash. When shopping in most African countries and in Europe you must pay a tax, known as Value Added Tax (VAT), on most goods which is much like sales tax in the United States. The difference is that the VAT is already included in the sales price and the rate of VAT varies from one country to another. The VAT typically accounts for 10% to 20% of the purchase price of merchandise and in Namibia the VAT is 14%. Foreign visitors can apply for VAT refunds in Namibia. Foreigners may be entitled to get back all or a portion of the VAT paid, in the form of a refund, on merchandise that is exported from the country being visited, however a refund may not be claimed on VAT paid for services, such as daily rates paid for the hunt. In Namibia, you must ask prior to making your purchase to be provided with the necessary documentation for the VAT refund, which consist of filling out an official government form and having it stamped, you must also provide your passport and airline ticket to prove that you are a visiting foreigner. To claim your refund at the airport, upon departure, you will be required to show the items that you have purchased and the required documents to customs officials prior to checking in your baggage to prove that the merchandise is indeed leaving the country.